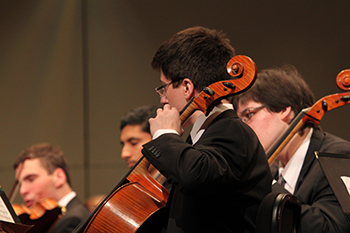 The Syracuse Youth Orchestra (SYO) and Syracuse Youth String Orchestra (SYSO) will present a concert on Sunday, April 19, at 3:30 p.m. in the West Genesee High School auditorium, 5201 W. Genesee St., Camillus. Tickets for the concert are $10 for adults and $5 for students ages 6-18. Admission for children 5 and under is free. Tickets may be purchased at the door. The SYO will perform the “Russian Sailor’s Dance” of Gliere, “Finlandia” by Sibelius and will feature SYO concerto competition winners Kathryn Kovarik, violin, performing the first movement of Edouard Lalo’s “Symphonie Espagnol” and Brian Gadbow, cello, performing the fourth movement of Elgar’s Cello Concerto in E minor. 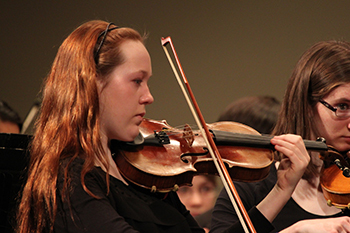 Kovarik is a junior at Manlius Pebble Hill School and studies violin privately with Linda Case. Gadbow is a senior at Whitesboro High School and plans to study cello performance at the Eastman School of Music at the University of Rochester in the fall. He is a private cello student of Gregory Wood. The Syracuse Youth Orchestras consist of some of the most talented middle and high school student musicians from across Central New York. Performing in these ensembles helps students grow musically and intellectually and learn discipline and teamwork that will benefit them throughout life. Auditions for the ensembles will take place in June. For more information, contact Erin Tapia at Syracuseyouthorchestras@gmail.com.